duck and an increasing list of incidents that all seem confusing to Jesse. Up to her eyeballs in threats and questions, Jesse’s outraged when the woman who hired her decides to fire her. Unbelievable! Unable to stop at that point, Jesse is determined to find the guy and solve the case. If only it was as easy as it sounded. I was hooked from the first page of Private Spies, when I read about "crawdads in the creek" (because, even though most people refer to the little beasties as crayfish or crawfish, here in the Carolinas we call 'em crawdads too.) I stayed hooked through the last page of this excellent first entry of the Jesse Morgan Mystery series. The book begins with Jesse getting her first case, for the P.I. firm she inherited from Joey, her boss and best friend. (Prior to this, she did all of her snooping on the web, and Joey did all of the legwork.) The missing-persons case quickly becomes complicated, when Jesse discovers that all of the "facts" she was told are actually fiction. While these complications are coming to light, another "complication" named Byron (a retired cop and college buddy of Joey) walks in the office door, stating that Joey hired him ― but neglected to tell Jesse. I won't reveal any more about the mysterious missing-persons case Jesse and Byron are working on (no spoilers here, remember? ), so you'll have to read the book to find out what happens. Jesse is very likable, a three-dimensional well-written character. Byron is also well-written, a tall, dark and handsome hunk-and-a-half with long dark hair, very caring and considerate of Jesse, with a wicked-good sense of humor. The only fault I can find in this book is that it lacks illustrations of Byron. (Is it just me, or has it gotten hot in here?) Bernice, the office manager, has a supporting role in the plot, but her characterization is not flat or dull by any means. The reader gets a sense of who she is and why she acts as she does; the same is true of the other supporting characters. P.J. 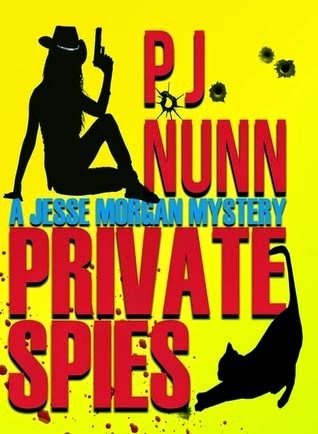 Nunn has written a clear winner of a book, an excellent beginning to the (long, I hope) Jesse Morgan Mystery series. If you like the Stephanie Plum series, I think you'll like Jesse Morgan also. Just think of Jesse as Stephanie's Texas cousin. I give Private Spies my top rating of five kitties, and highly recommend it! Look for the sequel to Private Spies entitled No Such Thing as Ghosts, due out in early 2014. Note: I received an ARC of Private Spies from the author, with no expectation of a positive review.